Assorted vintage porcelain plates are plentiful at flea markets and antique shops. Many casual browsers become impulsive buyers and, over time, accumulate a collection of mismatched tableware. If you are one of those "accidental" collectors or someone who has exerted a conscious effort to accumulate specific pieces over time, discovering current values could surprise you. If you have collected or inherited pieces of Gloria Fine Porcelain, you are wise to determine their worth before insuring or selling them. Authenticate your porcelain by its back stamp -- the mark imprinted on the back of each piece. In 1949, porcelain factory owner Anton Weidl moved from Austria to Bayreuth, Germany, and adopted the present mark of a crown over the word "GLORIA" as shown on the factory's website, where you will find illustrations of current production and prices. Consult illustrated reference books such as "Marks on German, Bohemian & Austrian Porcelain c. 1710-Present" by Robert E. Rontgen. Websites such as Kovels and Worth Point offer some free information on collectibles and antiques, and paid subsciptions are available for additional research and advice from experts. Review resale prices for Gloria porcelain on local sites of craigslist, eBay, flea markets and estate sales in your area. Judiciously compare the descriptions and photographs with your pieces to appreciate the price fluctuations based on age, condition and pattern. Consult a qualified appraiser if you want a professional opinion. Although estate sale auctioneers and antique dealers may be knowledgeable, choosing from the membership of the International Society of Appraisers will ensure an unbiased appraisal. The ultimate value is what a buyer is willing to pay, so be prepared to negotiate on items you offer for sale. Hand wash vintage porcelain with mild soap to protect hand-painted designs and gold trim. 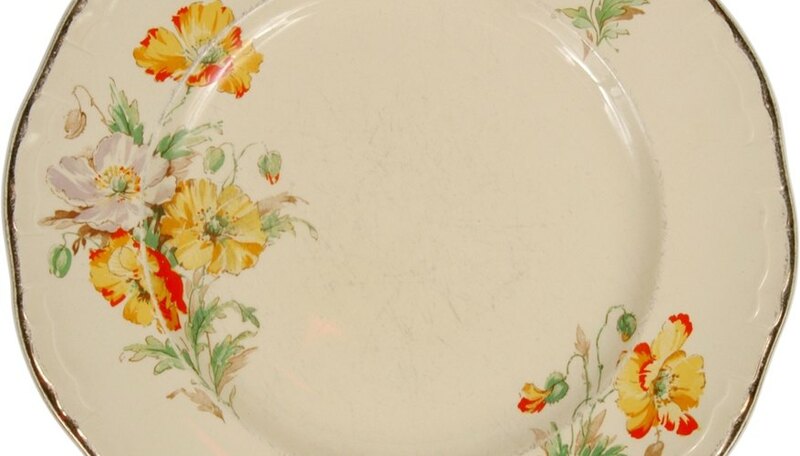 Do not confuse Gloria fine porcelain with a floral pattern marked "Gloria" from the Theodore Haviland China of New York. Be wary of any deviation in the backstamp; it could indicate the mark is counterfeit. A writer since 2002, Barbara Beaudoin wrote the "Head of the Class" column for "The Homesteader" newspaper, exploring issues in public education. She also contributed food history and restaurant reviews to the "Community Advocate" and is a contributor to "Cup of Comfort Cookbook" and "Rocking Chair Reader: Family Gatherings," published by Adams Media.